Region of South Bohemia – the Headquarters of the Faculty of Agriculture, University of South Bohemia in České Budějovice. There are a lot of interesting places to visit in the region of South Bohemia. We would like to introduce the most beautiful places to you. The capital of the region of South Bohemia is called České Budějovice. It is located at the confluence of the Malše and the Vltava rivers. The city was founded by order of Přemysl Otakar II. in 1265. The main square bears his name. It is situated in a historical city centre. It has an area of 1.7 ha and is the second largest square in the Czech Republic. Standing on the main square, the Samson fountain dominates the city. It was built in the 1720’s. Taming a lion, Samson stands on the top of the fountain. There is the Saint Nicholas church and the Black Tower on the north-east side of the square. The Black Tower used to be a church bell tower and a city tower in the past. It was designed by Vogarelli. There is a mighty tower called Železná panna (the Iron Maiden) on a riverbank. You can have some refreshments, and taste a good wine or beer there. A picturesque town of Český Krumlov is located approximately 25 km south-west of České Budějovice. It is a significant and famous touristic attraction in the region of South Bohemia. A castle has been built on a rock, just above a meander of the Vltava River. Appearance of the castle has been influenced by the Gothic, the Renaissance and the Baroque styles. The castle is guarded by Perchta of Rožmberk, a patron of the Rosenbergs. According to a legend, she has been appearing as a White Lady on various occasions, wearing a white gown and carrying a bunch of keys. A castle garden was established in the mid-sixteenth century. It has an area of 10 ha. There is a Baroque summer residence called Belarie in the garden. In summer time, there have been a lot of theatrical performances put on by the Revolving Theatre recently. Dramatic and opera ensembles of the South Bohemian Theatre perform in the Revolving Theatre. Various technical attractions may be visited in Český Krumlov. A graphite mine is one of them. Graphite used to be mined since 1767 within the region of Český Krumlov. This graphite mine was opened in 1975 and closed in 2003. Therefore, any of the guides showing around the mine can be former miners who used to work in this graphite mine. Ruin of a castle called Dívčí kámen (the Stone Castle Girls) is situated between České Budějovice and Český Krumlov. The best access to the ruin is from Křemže. After visiting the ruin of Dívčí kámen, you can continue to a hill called Kleť. It is a forested hill just a stone’s throw from Dívčí kámen. It is the highest peak of Blanský les. There is an eighteen-metre-high stone observation tower on the top of the hill which was built by the Prince Josef Schwarzenger in 1825. You can see Český Krumlov, České Budějovice and its surroundings from the lookout very clearly. If you are extraordinarily lucky with the weather, you can see the summits of the Alps. An astronomical observatory was built in 1957 near the tower. In the 1970’s, the second Kopernik’s cupola was built there. The observatory is opened to public. Specialists from this observatory can boast 1,013 planets they have detected and that have been confirmed so far. 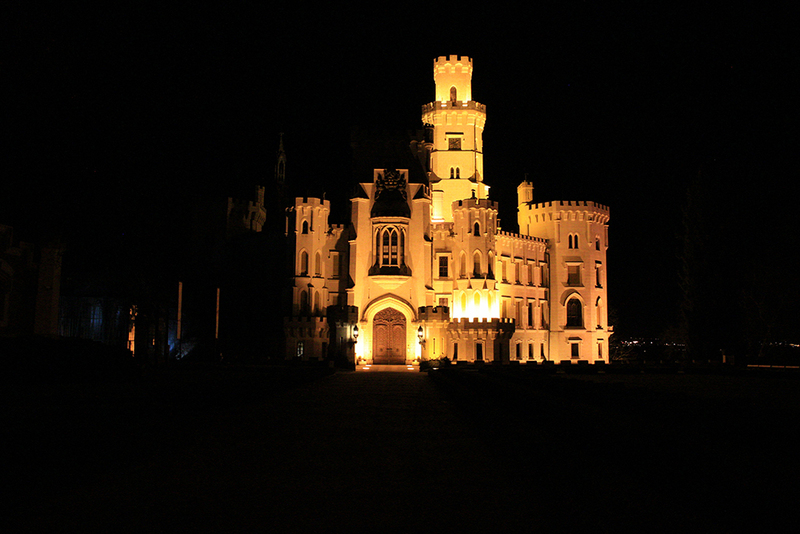 There is an attraction to visit on the way from České Budějovice to Písek, a castle in Hluboká nad Vltavou. There is a ZOO near the castle. 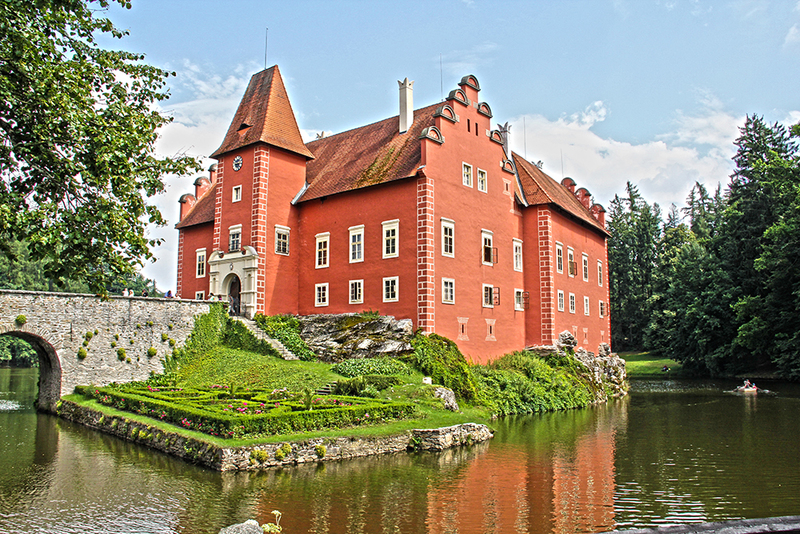 The castle is considered to be a pearl of the region of South Bohemia. It is a Neo-Gothic castle that used to be a guardian castle. It was founded by Wenceslas I. in the 13th century. Between 1661 and 1940, it was owned by the Swarzengerbs. In 1940, the last owner of the castle, Dr. Adolf Schwarzenberg immigrated to the USA. He fled the country because of the Nazis. Nowadays, it is a state-owned castle. There is a greenway leading along the Vltava River from Hluboká nad Vltavou to Purkarec. You can even take a steamboat going from České Budějovice to Hluboká nad Vltavou. The steamboat’s port is situated near a bridge, on the eastern side of Hluboká nad Vltavou-Zámostí. After passing the bridge, you can continue along the Vltava River on foot or by steamboat. There are two famous rocks on the way: the first rock is called „Bába“ (Grandmother) and the second one is called „Dědek“ (Grandfather). Both rocks are visible from the river and the river bank. You cannot see the Grandmother rock from a walking pathway, as it is hidden among trees. There is a greenway running around the Grandfather rock. There is a ruin of a castle called Karlův hrádek (the Charles castle) situated 3 km far from Purkarec. The castle was founded by Charles IV. in the 14th century. People were not living there for a long time. A son of Charles IV. was not interested in such a remote castle. Therefore, people left the castle just after it had been built and completed. There are high walls and a deep moat nowadays. Třeboň is a town situated between the Svět (World) and the Rožmberk ponds. It is a famous centre of fishing and fishery. A carp fish from Třeboň is the world brand. Třeboň is also a famous spa town, peat is used as a treating material there. Last but not least, there is a brewery, making delicious beer in Třeboň. The town was founded by Vítek from Prčice in the mid-twelve century. He called his settlement the Vítek’s meadow. There is a Renaissance palace in Třeboň. It was mentioned in literature in 1374 for the first time. In 1660, the palace came alive as the Schwarzengers, its new owners moved there. In 1940, the palace was occupied by the Gestapo. They founded a school of the Nazi air forces there. The National Administration governed there after the WWII. Since 1947, the palace has been a state-owned building. It was put under the state control by a special law called „Lex Schwarzenberg“ (together with the castles in Hluboká nad Vltavou and Český Krumlov). Třeboň has become a famous touristic attraction. From spring to fall, a lot of events are organized by the town municipality. Fairs take place on the main square in Třeboň every Saturday in summer. They are famous too. If you are seeking a quiet place to relax, you can visit Berta’s spa or Aurora spa. They are highly recommended in Třeboň. On the other hand, if you wish to do sports, there are a lot of greenways all around Třeboň. They are suitable for physically fit people, and less capable cyclists as well. A mighty fortified line was built around the Czechoslovak Republic in the 1930’s. The nearest bunkers are situated within the fortification area of Slavonice. They have been restored by volunteers since 2003. Two bunkers are opened to public. They are fully equipped with arms. You can see original machine guns (models 26 and 37), guns (model 24), a working hand ventilator, a bunker crew’s equipment and many other devices there. Guided tours are organized there. A machine gunfire demonstration takes place every first Saturday in July. The Šumava National Park is a protected natural area and a UNESCO biosphere reserve situated along the Austrian-German border. It is the largest Czech national park spanning an area of 68,064 ha. The Šumava protected natural area includes the Šumava National Park and spans an area of 99,624 ha. The Šumava National Park boasts 80 percent of forests. Stunning glacial lakes also make part of the Šumava National Park. There are five glacial lakes within the Šumava National Park: Plešné, Černé, Čertovo, Prášilské and Laka. Extraordinary experiences await you in the Šumava National Park. It is a great place to relax. A treetop walkway, greenways and emergency overnight accommodation (stretching from Nová Pec to Železná Ruda) have been built within the Šumava National Park recently. Nové Hrady is a town situated in the Novohradské Mountains. It was founded in the 13th century. There is a castle surrounded by a moat and lined with bricks in Nové Hrady. There is a „Residence“ on the main square. It spans the northern side of the square. Nowadays, there is a restaurant and a hotel in the „Residence“. There is a palace in Nové Hrady too. It used to be a children accommodation facility during the World War. Later, a secondary agricultural school had its headquarters in the palace building. The Academic and University Centre of Nové Hrady is located in the palace building nowadays. The palace is not opened to public, however an adjacent English park is. Nové Hrady is a town situated on the top of a hill. There is so called Terčino údolí (the Theresa’s valley) below the hill. It was founded by Theresa, the Duchess. It is a vast park, spanning an area of 138.3 ha. It has been the National Natural Monument since 1949. There are a Blue House, a blacksmith’s mill, a Swisse house and an artificial waterfall in the park. After passing the waterfall, go straight. Turn left at the first bridge and climb the hill. There is a stronghold called Cuknštejn. It has been reconstructed recently. 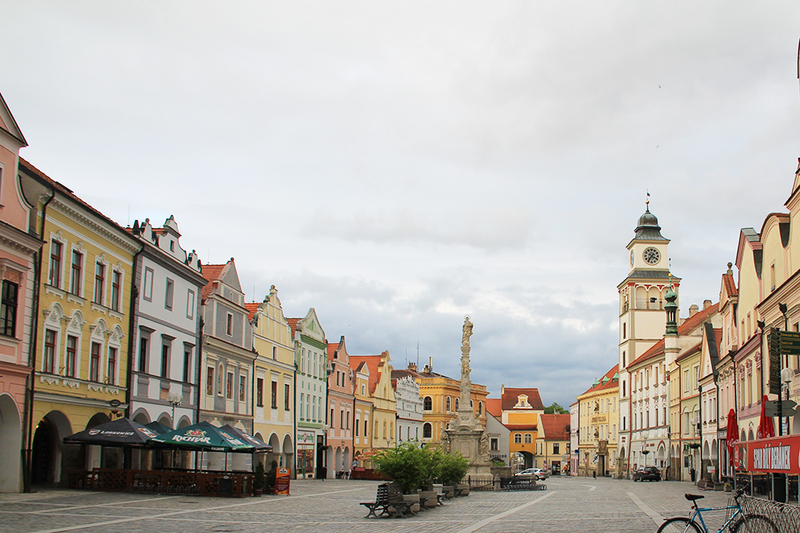 A picturesque village called Holašovice is situated 15 kilometres west of the faculty. It is inscribed on the UNESCO World Heritage list because of its architectural value. There is an interesting touristic attraction near Holašovice which has become famous and attractive too: a megalithic stone circle. It is situated on a meadow on the left side of the village, right at the end of the village. It is full of energy. Roaming the region of South Bohemia, you can visit this strange place and recharge your batteries there. A romantic castle called Červená Lhota is situated 50 kilometres north of České Budějovice. It stands on a rock and is surrounded by water. A boat can be hired there – it is possible to sail all around the castle by boat.